Twilight Language: The Sacrifice of the Lamb and the 5s? Nick Ut of the AP took a photograph (below) that circled the globe. 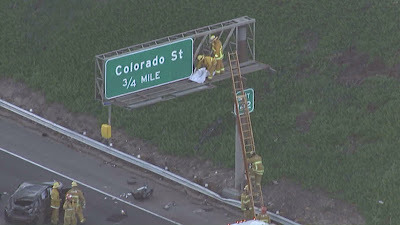 It was of a man on a highway sign. 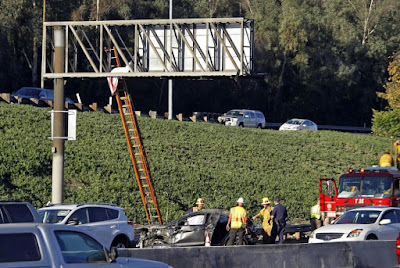 The body of Richard Pananian, 20, thrown from his car during an accident on the 5 Freeway on Friday, October 30, 2015, ended up on the sign. Authorities say Pananian may have been driving recklessly on the 5 when his car collided with another vehicle. His car flipped several times, and he was ejected from the vehicle. He was said to have usually worn a 5-point seat harness. Authorities said he was not wearing a safety beat. The latest shocker with this story is that 5 days previous to his accident, a lamb had been sacrificed on his behalf in a Armenian ritual. 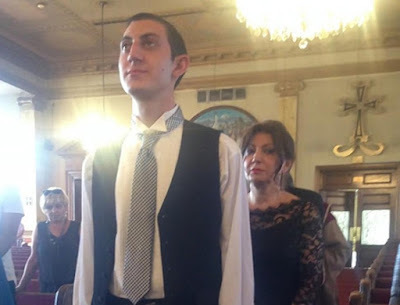 Pananian's cousin wrote that the family performed a "matag," or a lamb sacrifice, on October 25, 2015. He wrote that in Armenian culture, sacrifices are done when someone escapes death. Pananian's life "was once spared," he wrote. "I find it ironic that 5 days after this offering to God, not only did God choose to take this young man's life, but decided to make such a spectacle out of it," Kardashian wrote. "If God works in mysterious ways his way remains a mystery to me and has crushed this family as a whole." Today, a Russian plane crashed in South Sudan. The crew consisted of 5 Armenians and 1 Russian. What's with Colorado Street? 10/30 Pananian's freakish deadly ascent on to the exit sign for Colorado Street was proceeded on 10/26 by Sam Sarpong's deadly descent off the Colorado Street Bridge. (a Route 66 place) Both locations in LA County. Sam Sarpong, was a minor star, a super model & TV host. In your previous post are pics of a bloody-headed Ram.